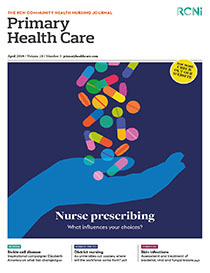 This article aims to understand the factors that influence nurse independent prescribers’ decisions in primary care in the UK. The author undertook a search of all relevant electronic databases and resources, as well as pertinent journals and reference lists of retrieved studies. Studies were assessed against specific inclusion and exclusion criteria, critically appraised, then analysed and synthesised using meta-ethnography. Three main themes were generated: perception of competence, perception of risk, and impact on patient. These factors are not limited to nurse prescribers, with evidence suggesting GPs also experience similar issues. It is vital that nurse independent prescribers are adequately supported. By understanding these factors, appropriate continuing professional development can be put in place. This will help to improve practice and service provision, which ultimately will ensure safer and more effective patient care.